I thought I would bring you a quick little project today. and have fallen in love with them. so, I decided to make one for myself. I knew you all would love it also. oh, about 3 months now. I am close to done but, still have a few projects to finish. we rent - so no major renovation. has been difficult at best. One of those areas is the space right above our sink. When I am doing dishes - I am looking at a blank wall. I wanted something bright and cheerful there to look at instead. I needed it to be fairly durable. So after, much debating I came up with this framed wreath. This is a thrifted frame I had on hand that I painted with DIY white chalk paint first. wrapped it with a pretty little blue with brown polka dot ribbon I had on hand. added a bird I had and look how Springy it is. 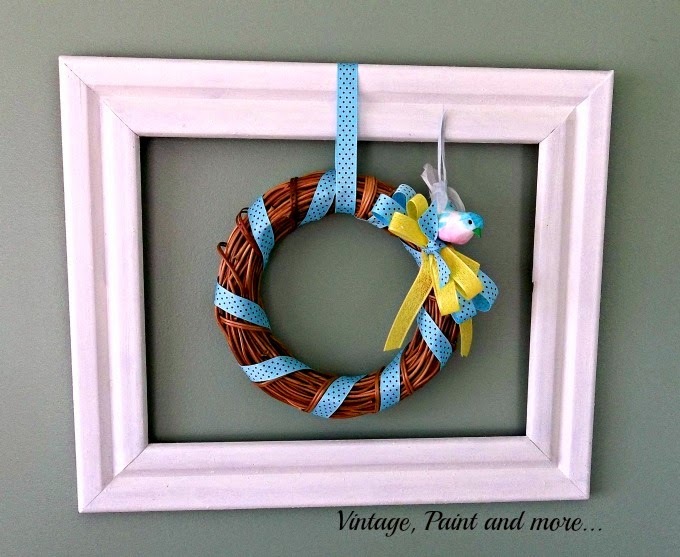 Then I hung the wreath from the side of the frame with a piece of the blue ribbon. I had to stare at every day. Plus, it's totally durable if water gets splashed on it. it was simple, easy and cost me nothing to do. What have you done lately to change a problem space up in your home? Love this project. I tried making a wreath once, and it was an epic failure. I like that this one is inside a frame. Really love the look! Cathy you're so creative! You make such the cutest things! Love it! What a great idea to fill up an empty space above the sink. My sink is in our island, and overlooks the family room, but I have always wanted my kitchen sink to have a window to look out. Thanks for sharing such a great craft!! It's so fresh and clean. The blue and yellow are perfect for spring. Really great idea to make the wreath pop! So pretty! 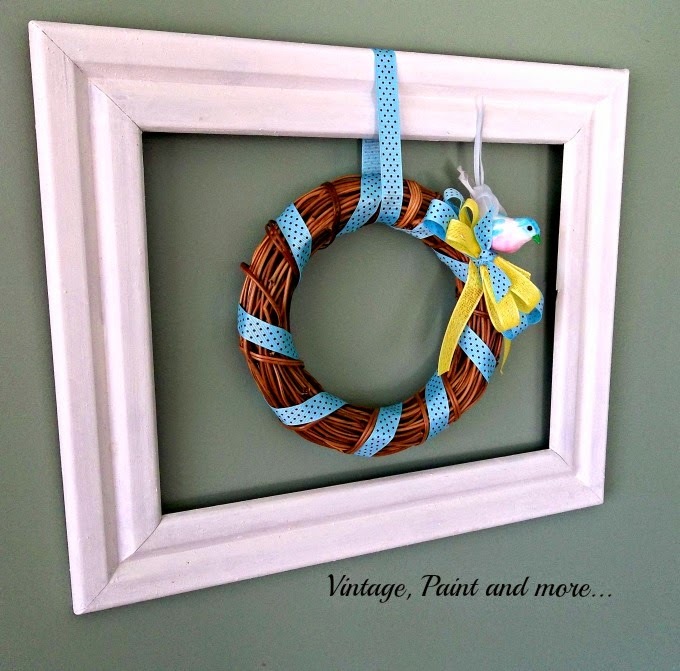 I love using old frames in crafts. 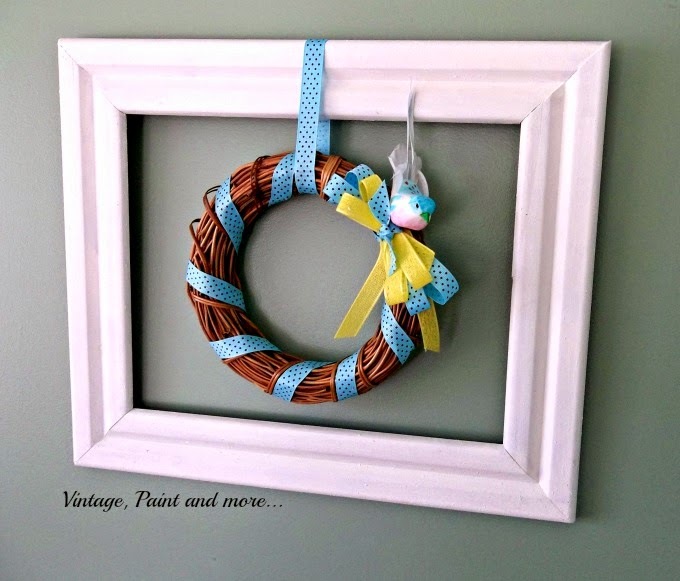 Cathy - What a cheerful and bright little wreath! Love it in the frame. You could not help but smile when you see that. I am new to your blog and your newest follower. The wreath is beautiful. It would brighten up any room. I love simple craft like this that are so lovely.